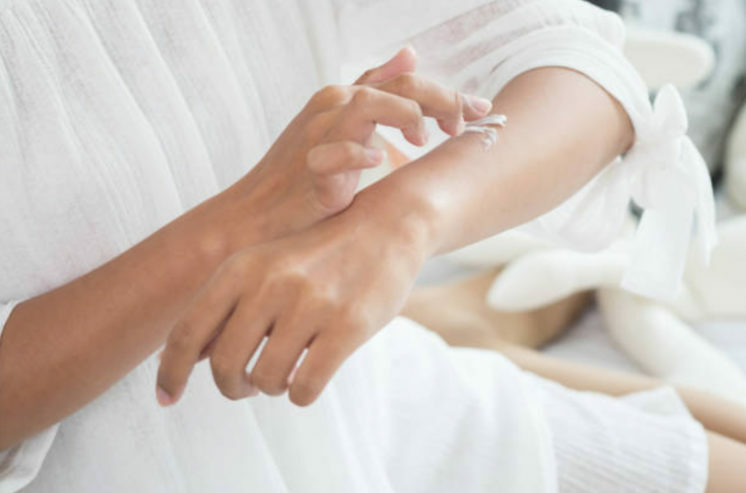 We expect a lot from our skin in winter: Sub-zero temperatures and constantly moving between indoors and outdoors can make our skin dry, flaky, and sometimes even itchy. That’s when you know the time has come to adapt your skin care routine to the cold temperatures so you can easily meet the challenges of the winter months. If you follow our four skin care tips, your skin will thank you and have a healthy glow throughout the winter. The most important thing in winter is moisture. First, it’s important to take care of your skin from within by watching your diet and drinking plenty of fluids. Hydrating drinks and foods are especially beneficial here. To keep your skin healthy, you should drink at least 1.5 liters of water per day. Not too keen on water? Then unsweetened tea is a good alternative. We recommend green tea or herbal tea, as they also support the moisture balance of your skin. Second, your skin’s moisture levels can be easily improved by treating the surface with rich creams that protect against dry skin. Although we always dress appropriately for rain, sun or snow, many of us forget to also change our skincare routines to suit the seasons. Winter is much drier than summer. This makes it important to adapt your skin care to the different conditions and protect your skin and give it the love and attention it needs. When temperatures drop below eight degrees, the skin stops producing sebum. This means that it receives and retains less moisture, which makes it dry and weakens the skin barrier. That’s when it becomes particularly important to choose a product that gives your skin plenty of moisture and optimum care. Our regeneration cream is ideally suited for this. The rich cream regenerates your skin for 24 hours. It contains grape seed oil that is rich in essential fatty acids and nourishes the skin. If you are planning to go on a long walk or to hit the ski slopes, you’ll definitely need sun protection. It’s particularly important to protect the skin when up in the mountains, where UV radiation is stronger. 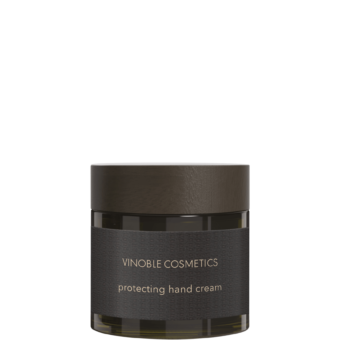 With its unique combination of UVA+UVB sun protection filters and grape stem cells, Vinoble’s protecting day cream SPF 30 UVA & UVB safeguards the skin cells against sunburn and premature skin aging. Unlike many other sun protection products, this cream doesn’t contain any endocrine active substances. When cleansing, it is also important to use products that don’t draw moisture from the skin, as can happen with treatments that contain alcohol. For the cold season, we recommend Vinoble cleansing milk 2 in 1. Thanks to aloe vera and soybean oil, it both cleanses and nurtures the skin. Our tip: If you’re looking for the perfect nurturing program for your skin type, take a look at our skin type finder, which will help you find just the right Vinoble Cosmetics skin care products for your needs. Large temperature fluctuations and constantly moving between the warm indoors and the cold outdoors can make your skin feel tight. It produces less oil and loses its protective function. An easy way to make your home more skin-friendly is to place a cup of water on a radiator or use a humidifier. Even airing out the room for just a few minutes can make a big difference to the indoor climate, as it regulates moisture levels and improves the quality of the air. A humidity level of 40 to 50 percent is ideal. Your skin will also be happy if you treat yourself to a nourishing bath once a week. Add a few drops of our pure grape seed oil to your bathtub and use our protecting hand cream as well. Our lives can be stressful at times, with opportunities to relax and recuperate seemingly few and far between. Today’s increasing demands and responsibilities, both at home and at the office, can lead to an unhealthy lifestyle and get in the way of beautiful skin. Even if you are stressed and under pressure, it’s important to get to bed early and stick to your sleep routine. Having enough sleep helps the skin to regenerate and form new collagen. Collagen is particularly important for our skin, as it enhances elasticity, which is essential for wrinkle-free skin. Our skin regenerates and produces new collagen during sleep. Ideally, we should get seven to nine hours per night. But in addition to getting plenty of sleep, you should also give your skin an extra portion of moisture by using a serum that is rich in nurturing oils. With a combination of jojoba oil, avocado oil, almond oil and grape seed oil, our regenerating oil serum nourishes the skin with essential fatty acids and moisturizes it overnight. Follow these skin care tips and you’ll be perfectly prepared for the cold season! Remember to care for your skin properly and with love, especially during the winter – your skin will thank you with a healthy glow.